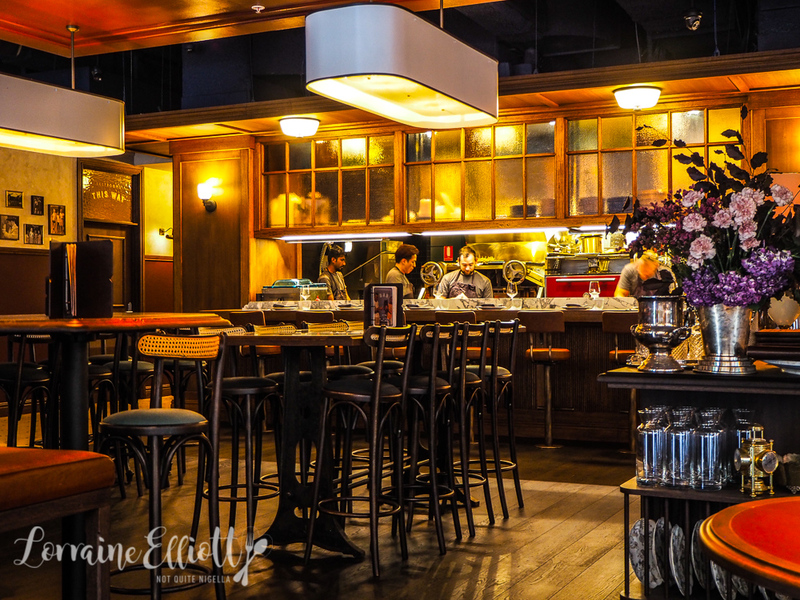 Be transported back to the 50's in this new eatery next to Wynyard Station. Bopp and Tone is named after the two owner's grandfathers Keith "Bopp" Evans and Anthony "Tone" Adams and harks back to swinging big band times. 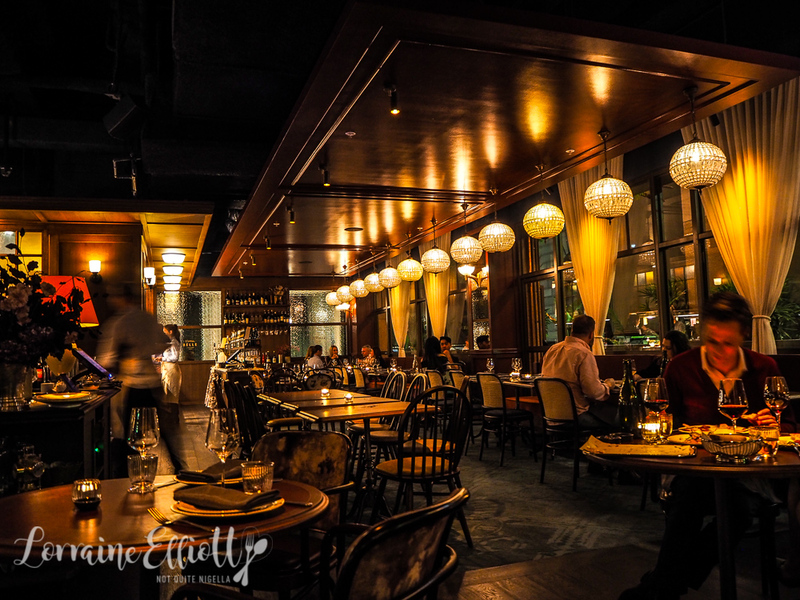 The atmosphere is old world while the menu is Mediterranean and Modern Australian. It's a month before Christmas and Ivy, Ryan, Mr NQN and I are already in a celebratory mood when we walk into our dinner destination (the earlier drinks and snacks also helped). Sammy Davis Jnr is crooning in the background and Ryan starts singing. Bopp and Tone is located at the corner of Carrington and Wynyard Streets and replaces Steel dining. I missed their launch party because I was interstate and when I looked at images of it one thing stuck in my mind: the booths. So when I booked I asked for a booth. 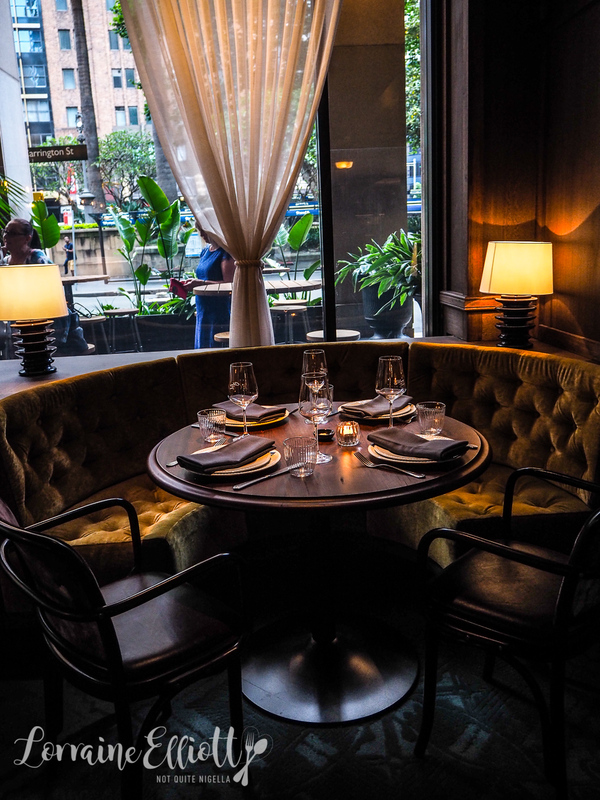 We are led to a golden velvet booth by a window and Ivy and I slide into the booth side while the guys take the chairs facing us. 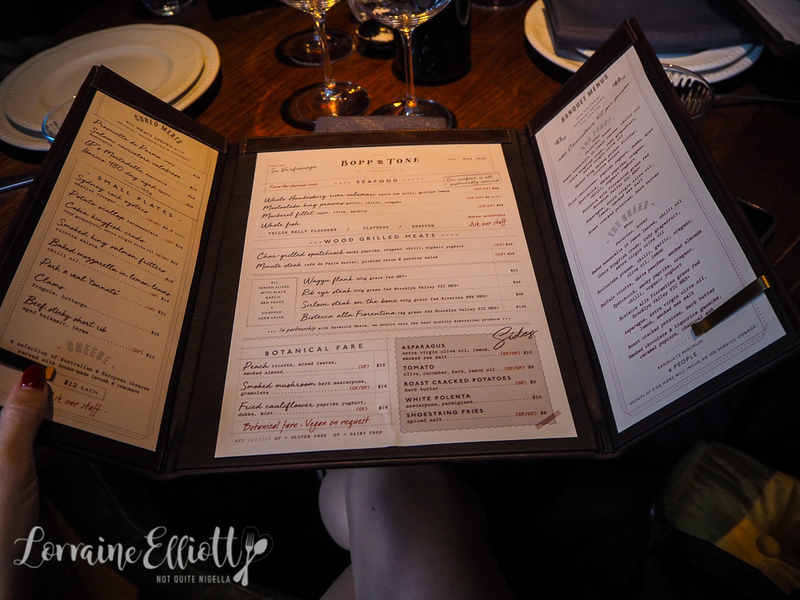 Although we normally don't order the banquet menu, the $65 a head banquet menu had everything that piqued my interest plus a few more dishes so we go with that. The head chef is Sa Va'afusuaga. 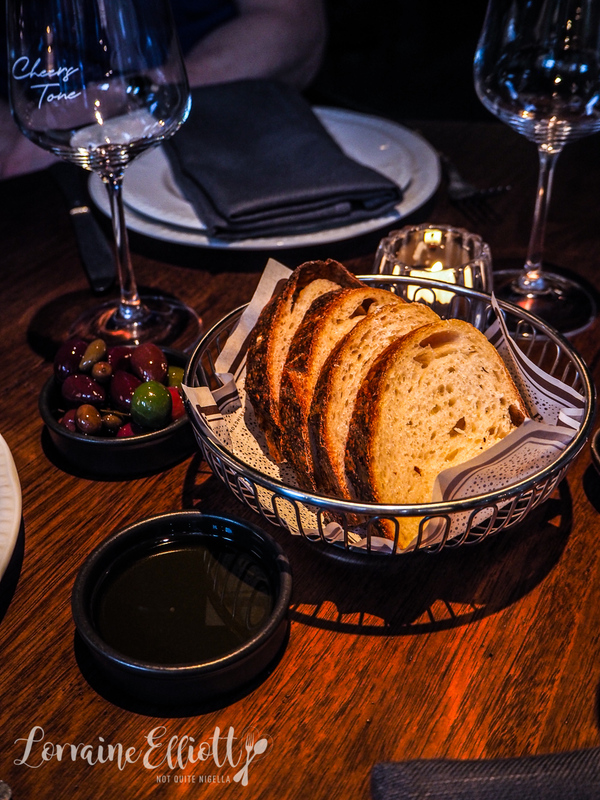 Service is very friendly and lovely and they also bring complimentary olives from Orange, olive oil and bread to the table (we've become accustomed to paying for things like bread and olives nowadays that this is a nice surprise). 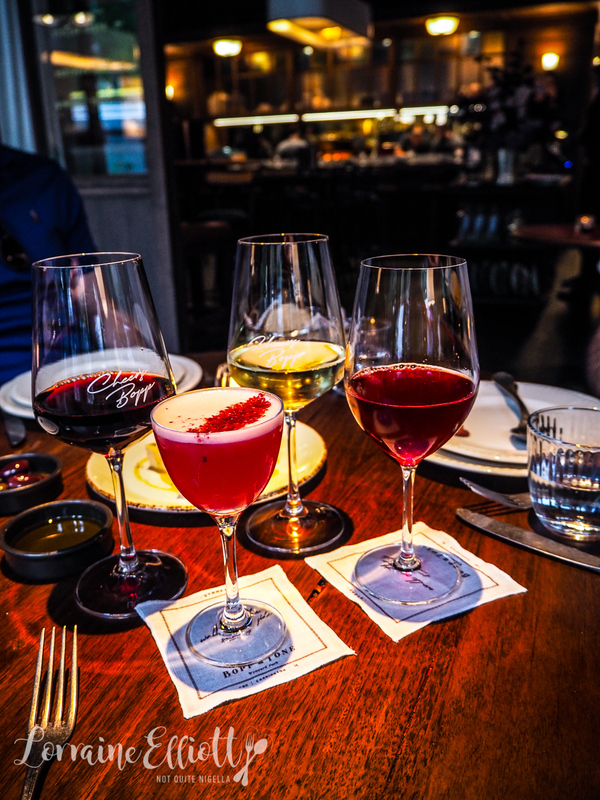 The drinks list is comprehensive and features an interesting section of "Fancy wine" which is like a cocktail that is designed to mimic wine. Mr NQN orders the Rosso Fancy Wine with Jim Beam, Campari, verjus, mulberry, Davidson plum and bitters. It's quite nice, not exactly like a wine but like a dry cocktail. I order a Plum Fizz with Seedlip Garden 108, Davidson plum, lemon, soda and aquafaba in place of egg whites to foam and this is a tart, lip puckering drink. The food starts arriving shortly after. I love pecorino cheese, especially after holidaying in Rome where it is used in place of parmigiano. It comes drizzled in a thyme infused honey. It's one of Ivy's favourite dishes and lovely in its simplicity. The item I actually can't stop thinking about is a modest sounding one. 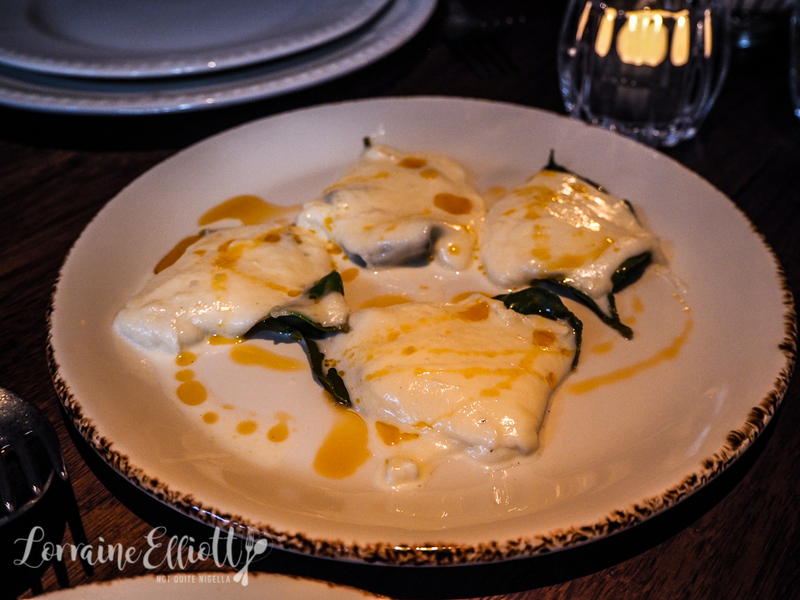 The mozzarella pieces are baked on lemon leaves and drizzled in chilli oil. You aren't supposed to eat the leaves, just lift the creamy, oozy mozzarella off the leaves and chew in a satisfying manner. Honestly, how is something so simple so good? Next are the fritters which are meant to be served as a tower but the waiter knocked them over while putting them down so they don't look quite as pretty as they were meant to. 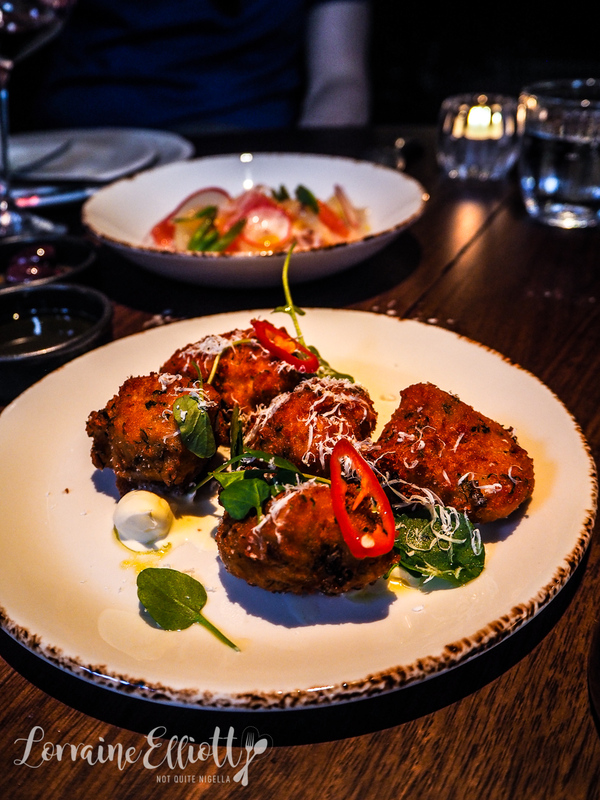 They're a light textured salmon potato fritter that come five to a serve which I like because that means that if someone really likes it they can have another. On top is some grated ricotta salata for seasoning. 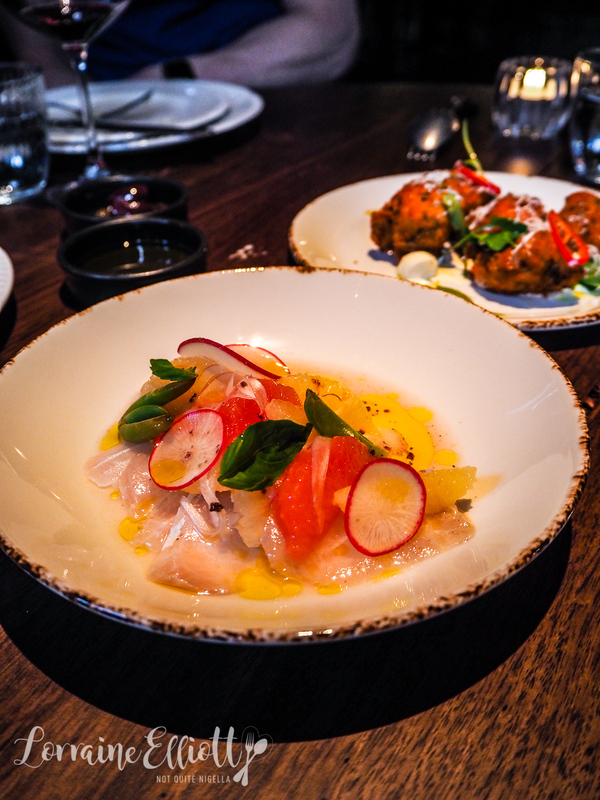 The crudo is served as large slices of cobia or black kingfish with segments of ruby grapefruit and extra virgin olive oil. It's fresh and tasty. The next two dishes arrive together. 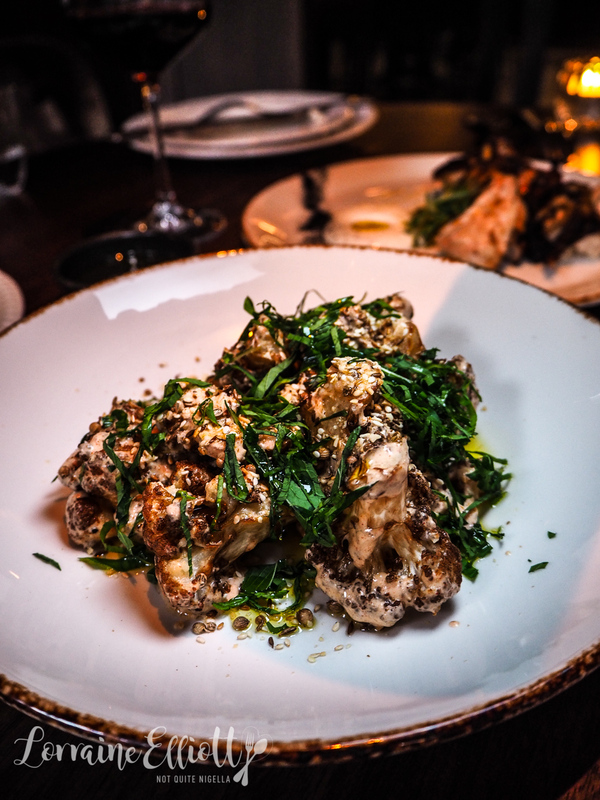 The fried cauliflower is soft florets of cauliflower with a paprika yogurt, crunchy dukkah and mint. It goes well with the spiced spatchcock below. I have to admit I went for seconds of this. 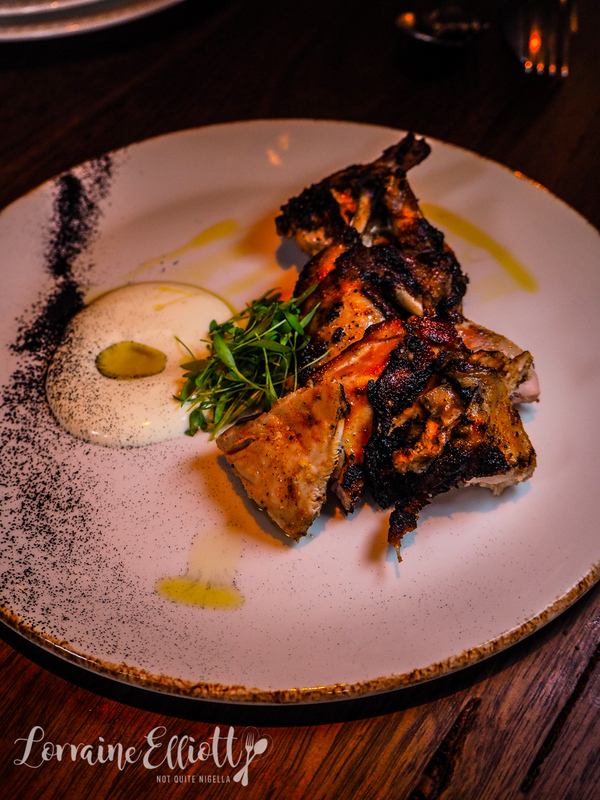 I love the char from the grill and the spatchcock is succulent and blistered with a smoked paprika, oregano and chilli spice mix with a touch of sweetness to it. It sits next to some organic yogurt and olive oil. 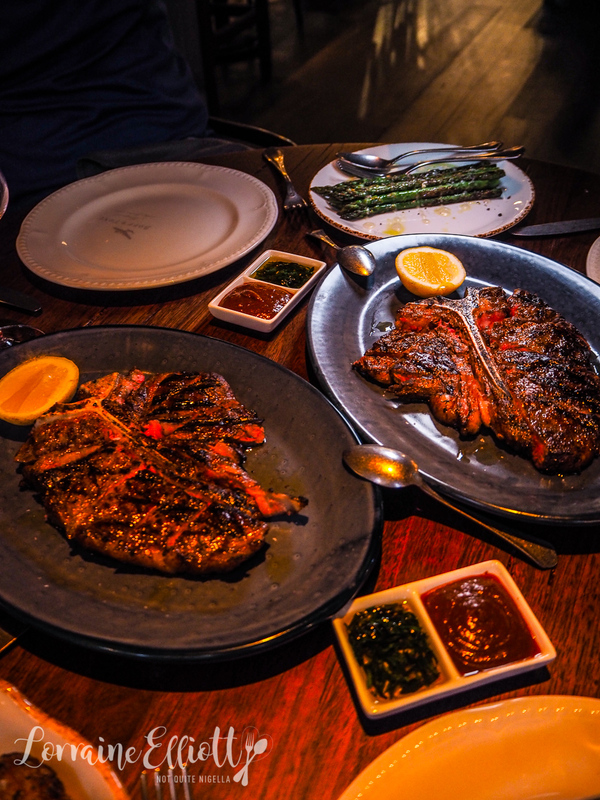 Usually the Bistecca alla Fiorentina or Tuscan T Bone steak on the regular menu is a massive 1kg and costs $135. With this menu we get 2x400g steaks served with house made barbecue sauce and a salmoriglio herb and olive oil sauce. The barbecue sauce is excellent while the herb sauce needs a bit of piquancy. I stare at the bone lustfully and mutter (mostly to myself) "God I just want to eat that bone," and Ivy hears me and says, "Why don't you?". And so I do with not a care in the world and it is heaven - honestly don't disturb me or ask me any questions during this time. Ryan tried some of these potatoes and said, "They're terrible" which is his way of getting more potato. These are pretty damn fabulous. Steamed and then fried they come in a crunchy, spiced coating with a sweet spice to them. 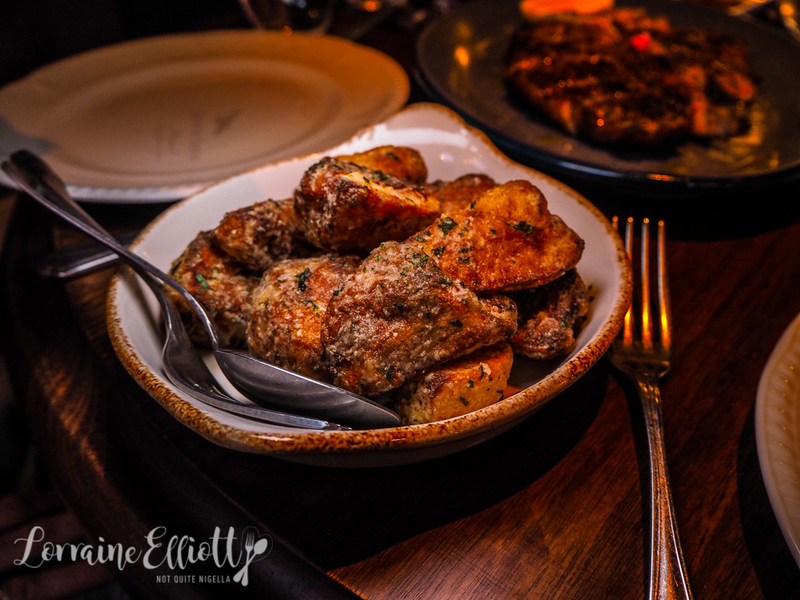 The potatoes are nice and fluffy on the inside yet crispy on the outside. 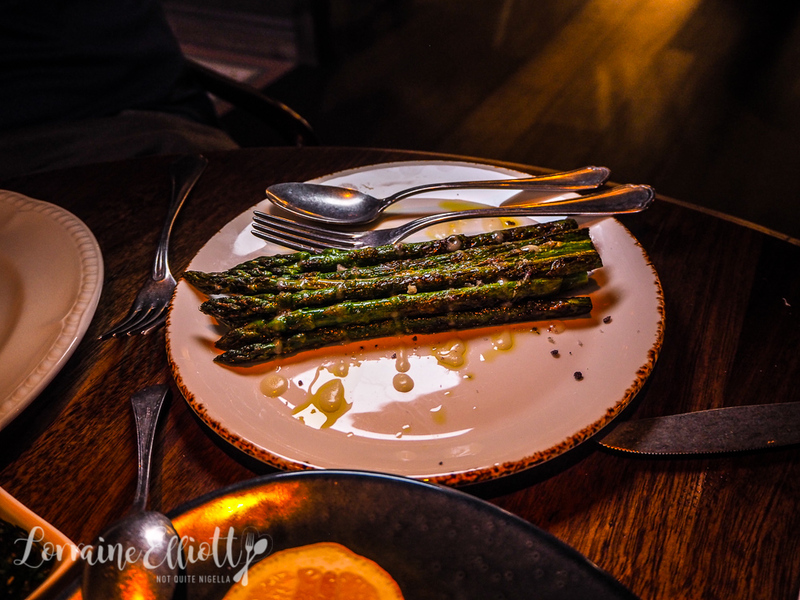 There's also a side of grilled asparagus with lemon, olive oil and smoked salt. Dessert isn't included in the $65 menu so we order a couple extra to share (although by this stage we're really quite full). We really wanted to love the peanut butter dessert and while it smelled peanut buttery it didn't taste very peanut buttery at all. 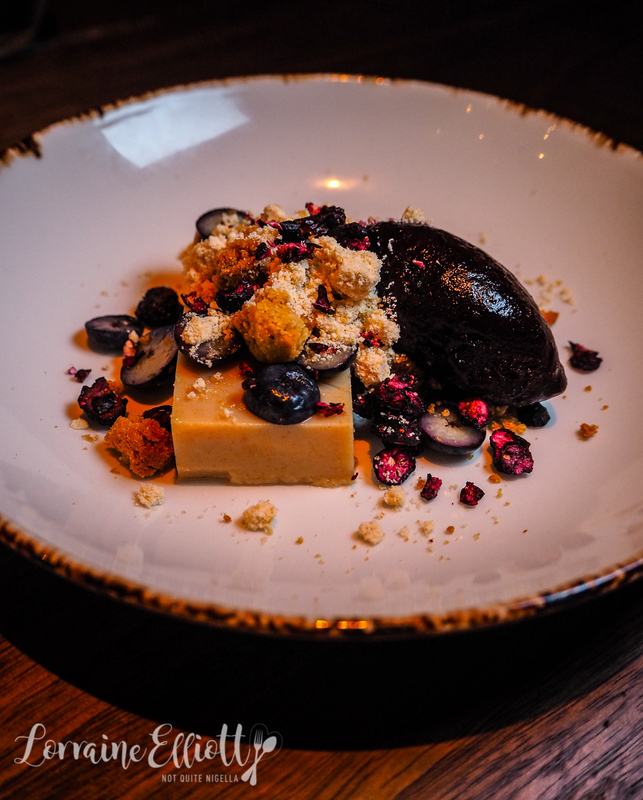 In fact the dominant flavour was the blueberry from the sorbet. The texture of the panna cotta was also very firm set and not in the slightest bit wobbly. Luckily we had a back up dessert. 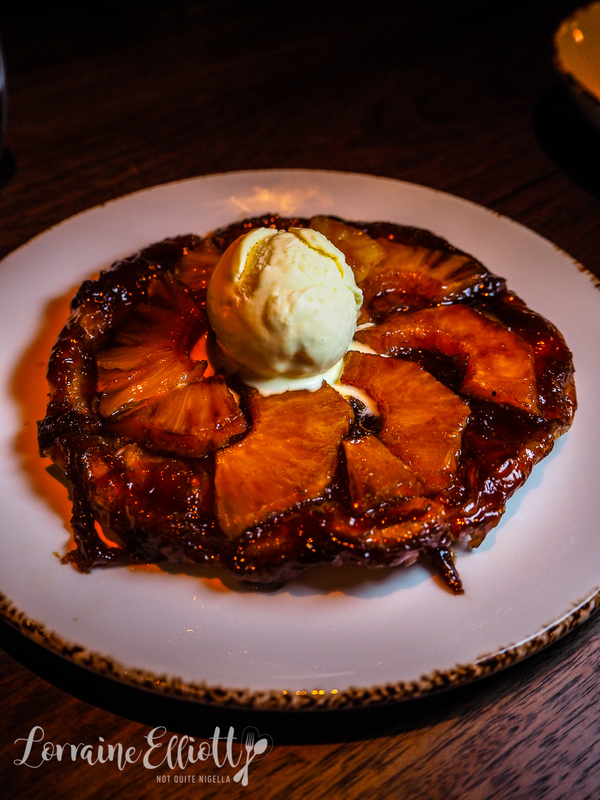 The pineapple tarte tatin is sublime. 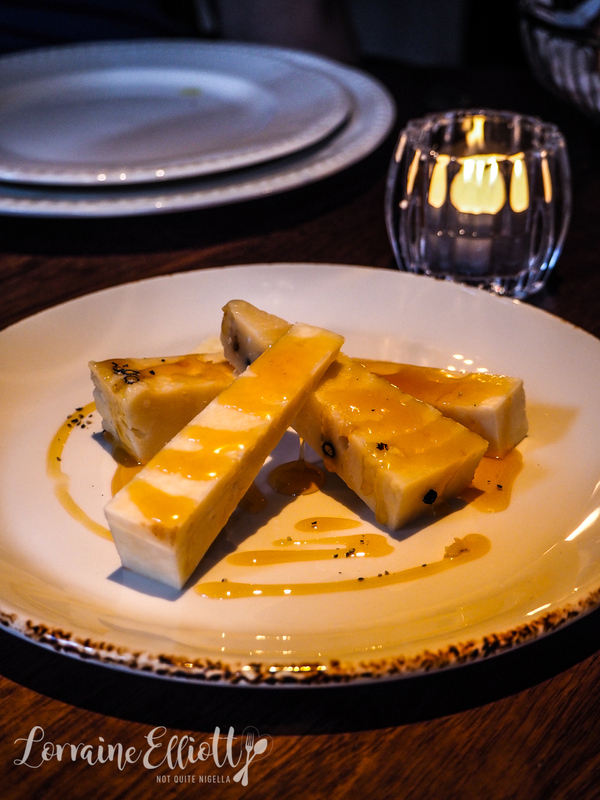 There's just the right amount of buttery pastry, sweet, tangy pineapple and caramel sauce and the ice cream is distinctly lemony picking up some of the pineapple's tartness. 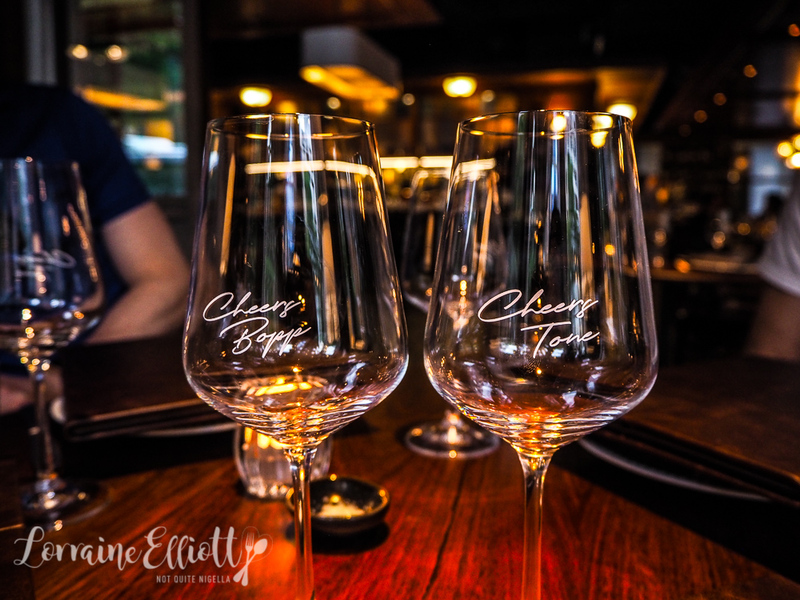 So tell me Dear Reader, when you book a table, do you ask for a specific one or type? Have you tried Bistecca alla Fiorentina and do you enjoy this cut of steak?